Saudi Arabia’s agriculture. 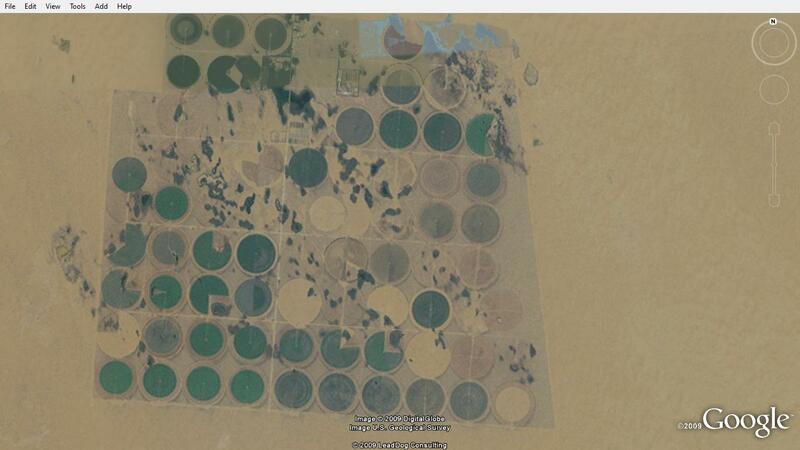 Mostly without a suitable climate, Saudi grows crops in 1km circles as you can see. However, this practice is soon to be given up for being too water intensive. The same crop circles are at the center (slightly ‘up’) of this picture. This is to show just how artificial the installations are: they are, quite literally, growing crops in the desert. With the money that Qatar has at the moment and will have for generations to come, it would be foolish to suggest that what amounts to growing produce in the desert will automatically fail. Perhaps these public-private partnerships can devise some clever work-around or new technologies that can breathe new life into Qatar’s agricultural sector. However, the challenge is indeed great. 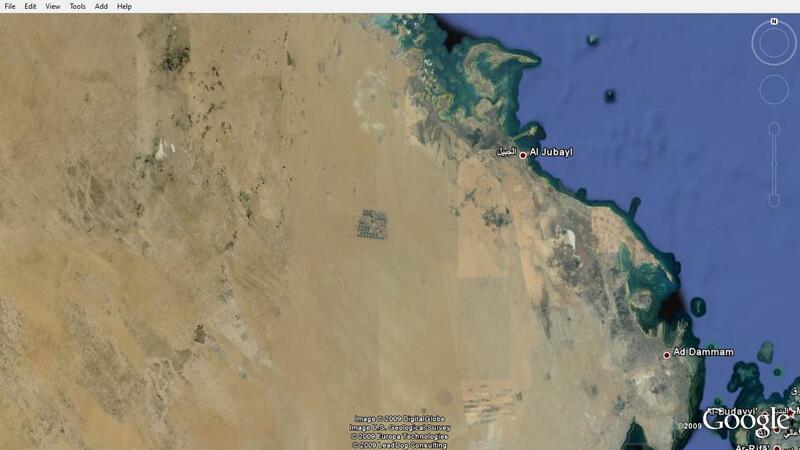 The center of the Qatari peninsula (if not most of the Qatari peninsula) has long been noted as a particularly harsh, hostile, barren and almost uncultivatable swathe of land. Of course, given enough funds, enough trucks of water and enough laborers from India or Pakistan, the land can be cultivated, but the opportunity cost of this is immense. In addition to the (most likely) huge initial set-up fees of such ventures, the produce produced will have to be (I would imagine) highly subsidized. Such costs do not matter so much now when Qatar is awash in Oil and Gas cash but unless some fairly spectacular advances can be made, such projects will prove to be unfeasible in the long-term. Indeed, Saudi Arabia has been through a fairly similar process. Faced with issues of food security, they sought to subsidise and invest in their own domestic agricultural industry. However, recently they have conceded that in fact such a policy is just not feasible in terms of the water needed to pursue such a goal and they stopped subsidizing farms. Saudi Arabia has, therefore, accepted that it will have to import its food and has gone about buying up swathes of land around the world in what is frequently referred to as neo-colonialism. Recently, I wrote about how Qatar, after initially pursuing a similar policy, was changing tack somewhat and instead seeking joint ventures with companies in, for example, Sudan. Whilst the end result of crops being exported from (often) poorer countries still results, at least this way Qatar somewhat avoids the stigma of being labeled neo-colonialists and there is arguably more chance that investment in the land in the poorer country may do more good than if the land were solely owned by the richer state. Given that Qatar clearly has to address this food security conundrum, I think that they should seek their food security in equal, fair and mutually beneficial relationships with companies or if need be governments around the world. Yes, this does sounds all very nice and jolly, but I think there are real gains to be made off the back of a manifestly fair deal. Were Qatar to invest meaningfully in agricultural development in a country, improve its port infrastructure, its road infrastructure etc and guarantee a set level of foreign currency earnings for a country, they could surely obtain cast-iron guarantees of supplies. If Qatar were seen as a partner in development who, of course, wanted grain, but nevertheless developed the surrounding indigenous industries and did not simply pillage produce at a bulk-sale, low price, then were the highly unlikely event of a country turning their back on such a beneficial deal to happen, then there would surely be other countries lined up to take on Qatar’s investment. If the deal was done in an equitable manner, what benefit would a crop-growing country have for rejecting Qatar’s investment in the first place? Overall, not only would Qatar be securing a significant portion of their food security but they would be meaningfully developing a developing country, something that Qatar, ever aware and savvy to the world’s view of such actions, could promote loudly and proudly. There are many ways to make food security joint ventures work well for both parties. First, there must be serious dialogue regarding the needs of both countries. Every society is composed of families with needs. If private companies can benefit the population who supports their business operations, then governments can do it as well. Qatar seems to have more of an interest in this than other GCC countries. I live in Ukraine, for example, and we are working with a small town of 5000 people to develop a large dairy business which would export milk derivatives globally. IN OUR BUSINESS PLAN we have provisions for making our employees lives a little easier. Working with schools, libraries, universities, hospitals, etc, we can effect our new home town in ways no UN, NATO, or government plans can seem to get done. Why? It’s because we will not only talk and conduct “studies”, we will ACT, and put our money where our mouthes are. I think Qatar will be successful in its search for good food partners, and its conviction to help its host partners. Maybe they will even come to Ukraine. To clarify, they are “importing” their food yes, but they are importing the food that’s being grown on saudi owned properties in Africa. This is not out of the news yet… in fact, the accusations of human rights violations are only just starting.